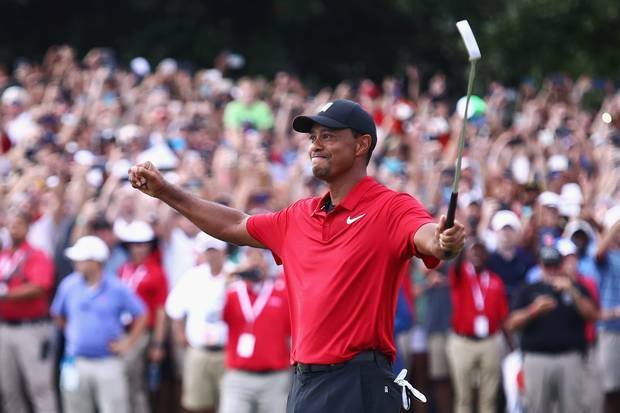 BBC – An emotional Tiger Woods completed an astonishing comeback to win the season-ending Tour Championship by two shots and record his first win in five years. Woods holed out for par to complete a final round of 71 for an 11-under total before holding his arms aloft in celebration of a brilliant win just days before the Ryder Cup gets under way in Paris. England’s Justin Rose lost his world number one ranking as a result of finishing tied fourth but secured the overall FedEx Cup which determines the season-long PGA Tour champion – the first Englishman to do so. Rose birdied the 18th at East Lake for a 73 to finish on six under and seal the top-five finish he needed to win the $10m (£7.6m) bonus on offer as FedEx Cup champion. “It was just a grind out there,” Woods added. “I loved every bit of it, the fight, the grind and the tough conditions. He came into the final day of the tournament – playoff of four FedEx Cup play-off events – with a three-shot lead over Rose and Northern Ireland’s Rory McIlroy, who faded from contention with a 74 to finish on five under in a tie for seventh. Woods birdied his first hole – one of two birdies and three bogeys – with his place at the top of the leaderboard in little danger during the final round. “It’s been tough. I’ve had a not-so-easy last couple of years,” he said. “I’ve worked my way back. I couldn’t have done it without the help of all the people around me.